Handyman Services Glasgow, Joinery, Plumbing, Tiling, Decorating, Roofing, Cleaning | Handyman services in Glasgow area. 25 years experience of trade services – joinery, plumbing, decorating, flooring. OAP Discount given. Welcome to the website of Handyman Services Glasgow. We cover the whole of Glasgow and the surrounding areas. All our work is guaranteed – we have £1million public liability insurance. OAP Discount given. We offer many trade services – use menu above or the links below for more information. You can call us anytime on 07543 430 892 or 0141 954 0417. We will provide you with a free, no obligation quote. All joinery work carried out. New Kitchens supplied and fitted including white goods. Flat-pack furniture assembled. Porches built and supplied. We are available for all general electrical jobs. We offer our customers unrivalled electrical services throughout Glasgow and the surrounding areas. All work carried out to a guaranteed high level. We can supply and fit any wood moulding including door facings, skirting, dado. Increasingly popular service with our clients. From a leaking tap to blocked drains, burst pipes to a complete bathroom suite fitted. 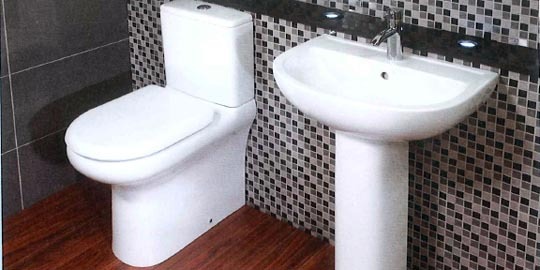 Five piece Armitage Shanks bathroom suite for only £499.99. All kitchens and bathrooms tiled. Also offer outside steps tiling service too. Hardwood flooring and Slate flooring services provided. We’ll supply and fit for you. All walls and ceilings repaired / skimmed. We specialise in period coving. Also archways built, fireplaces removed and vented. All interior house painting and exterior house painting. We use only branded paint for the best results. All paths, walls and roofs de-mossed. Roof coating and sealing service available. Full garden landscaping service provided including design. Turfing, slabbing, fencing, drainage, brickwork and decking services available. We will remove all fireplaces including hearths, brick, vent and plaster. We will remove all silicon from around baths, sinks, toilets etc. We only use proper anti-fungacide sealants – a lot of black marks are caused by using inferior sealants. We can fit out your bathroom to your own design or we can help with that too. We have a high rate (90%) of projects worked within original budget. We can replace felt roofs on sheds, garages etc – a real blessing after storm damage. We carry out all types of slating work which also includes lead work too. Call us for a free, no obligation quote. We will come out and quote you for any of the services as described above. If you don’t see the service that you require just call us now and ask. We’d be delighted to help.